While the bill includes an overall ban on the inclusion of noncompetes in employment documents, it does provide an “out” for employers. 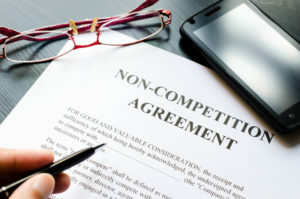 Employers are permitted to require employees to sign a noncompete if the employer can show that the covenant does not have an anticompetitive effect. But are employers willing to take that risk when the bill gives employees a private right of action against employers who violate this bill; a right of action that includes the recovery of punitive damages and attorney’s fees? Probably not. Especially when the bill states that noncompetes are presumed to be anticompetitive. Of course, this bill still has to be passed by the House and the Senate, something that, to date has been unsuccessful. Three bills similar to the MWA all died when introduced in 2016. And on a state level, while California did ban noncompetes, other states like Hawaii and Illinois attempted to do the same, but failed. The closest that any state (other than California) has come to implementing any ban on non-competes are states, like Massachusetts, that banned the use of noncompetes for physicians. So for now, there is nothing to do differently. But employers should have an action plan that anticipates this possibility. For instance, many companies have, for various reasons, simply stopped using non-competes at all, and are relying solely on non-solicitation and non-disclosure provisions to give them the protection they desire. But remain cognizant of the fact that, while federal bills banning noncompetes have fallen short, they were all introduced to a Republican controlled House and Senate. It leaves one to question whether the outcome would have been different had the bills been introduced to a Democratic controlled House and Senate.